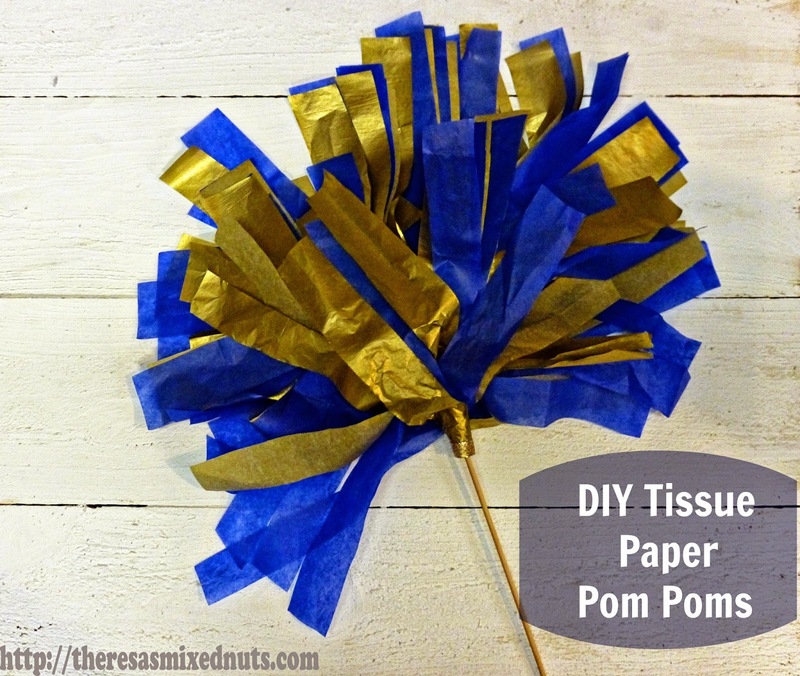 Theresa's Mixed Nuts: DIY Tissue Paper Pom Poms! DIY Tissue Paper Pom Poms! Woot, Woot! College football season has begun! Allison likes to pretend to get into the game with us, so I thought I would whip her up her own set of pom poms so she could cheer on our team. These tissue paper pom poms are so simple to make, they can be thrown together in about 5 minutes. Best of all, you can customize the colors to match your favorite team. Since we are huge Notre Dame fans, I chose blue and gold for our poms. Start by stacking 4 pieces of tissue paper together. Fold stack in half. Starting from the open end of the stack, cut slits towards the fold, stopping about 1/2 inch from it. Hot glue the end of a wooden dowel at the end of the stack. Start rolling the folded end around the dowel until you reach the other end. Secure in place with another dab of hot glue. Do you watch football? What team are you rooting for? How cute are those?? Yes, we are a football family and we only root for the New England Patriots!!! So cute for little girls! My husband and Isaak are excited to watch the Huskers. So many people here is all about them. It's like the color red took over their clothing. haha she can cheer away with those. Nope, don't watch it at my sea. What a great idea! Can't say I watch much football of any kind here in Canada. Nope, not even hockey for me! That would have to be the Dallas Cowboys. Love those pom poms. You're so creative. Those are really cute. We don't watch football at our house at all. It's one of the few sports that no one in my family has any interest in at all.